I guess you probably know what this post is going to be about. Peppermint. In many ways...old ways, new ways, blinking and twisted ways. If you have a love for that striped little candy, this is for you. And if you really don't care for peppermint, this post is for you too. Welcome to the Peppermint Party where a Peppermint Palace greeted the guests! I ordered a white cardboard castle online and spray painted it silver. Then I continued to decorate it with red poster board, wrapping paper, white paint and faux snow. 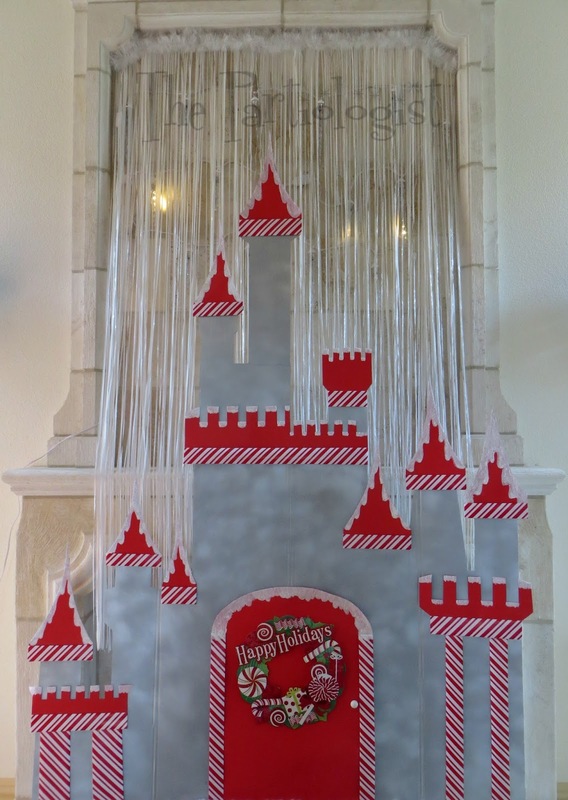 Behind the castle, I hung dripping icicle lights to resemble snow falling behind the castle. 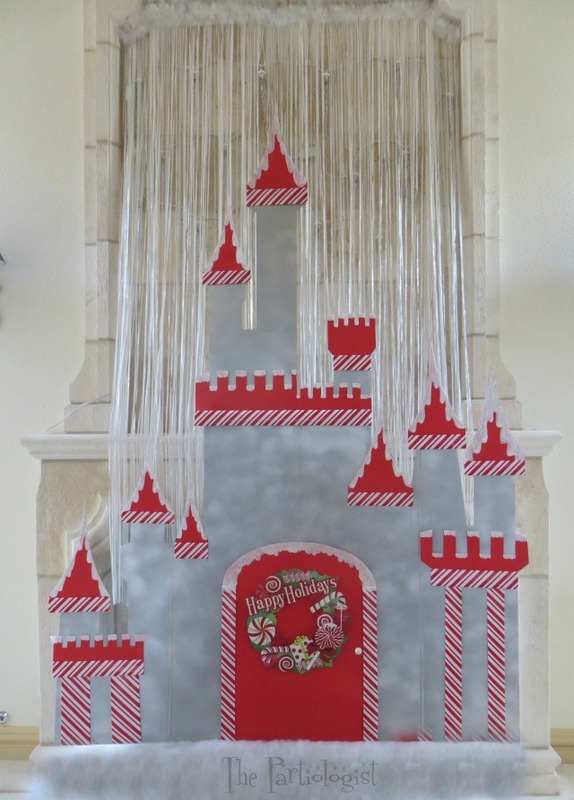 I covered the cord with a white plastic door banner and topped it with white Christmas garland. It finally came together they way I intended. 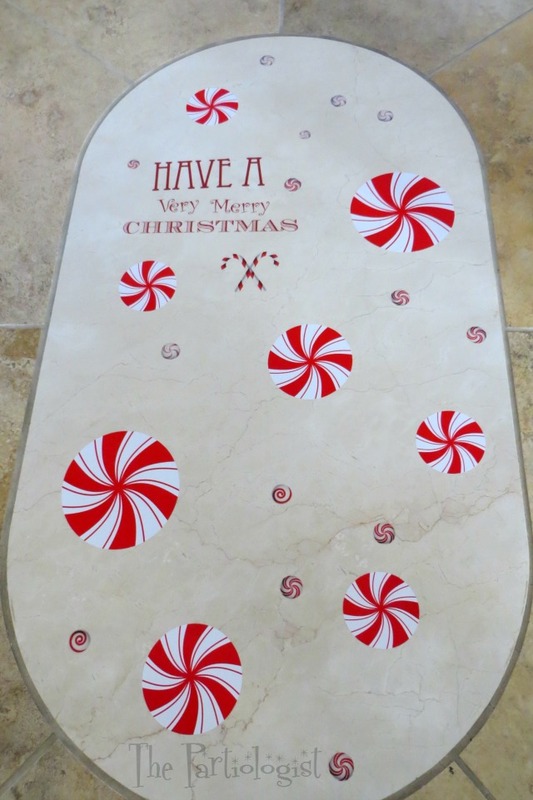 As soon as the guests arrived, they were greeted with peppermints on the entry floor. Now, lets wonder on over to the kitchen. Even though it looks like everything could taste like peppermint, it's not. In fact, nothing is peppermint flavored on this counter. It's just decorated like peppermint. 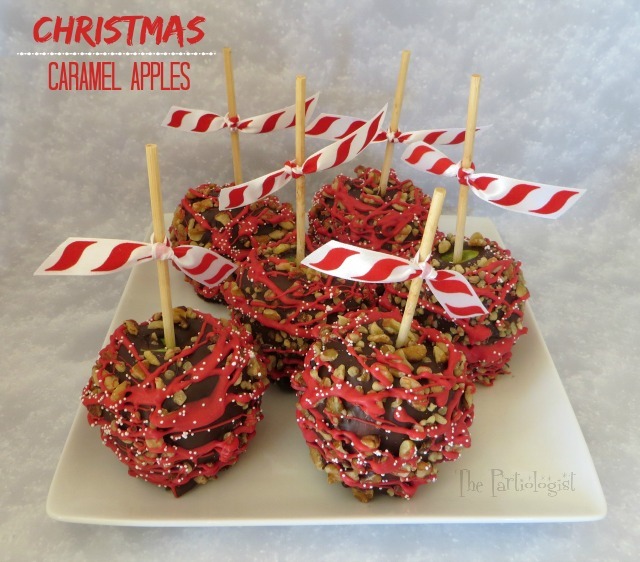 Originally, I had planned to dip the apples in caramel, chocolate then peppermint candy. But my love for a nutty apple took control. Sometimes you feel like a nut, sometimes you don't. 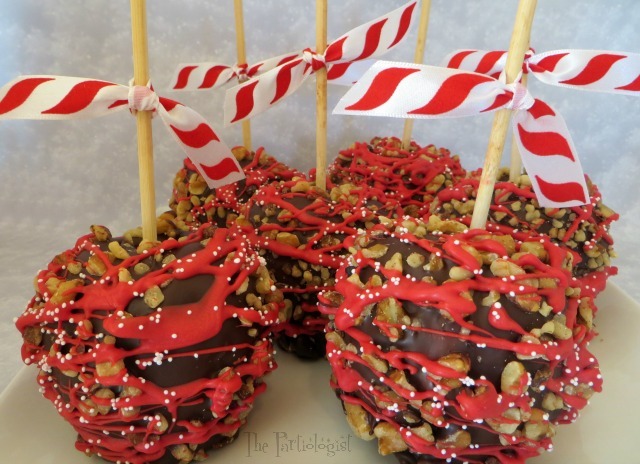 So I did what any nut lover would do, dipped the apple in caramel, chocolate added nuts and a drizzle of red chocolate along with a few magical white sprinkles. The white sprinkles are always magical at Christmas. Then in the middle I added twisted caramel chocolate covered pretzels. I told you it was twisted. Along with the green, white and red sprinkles, which makes it triple magical. 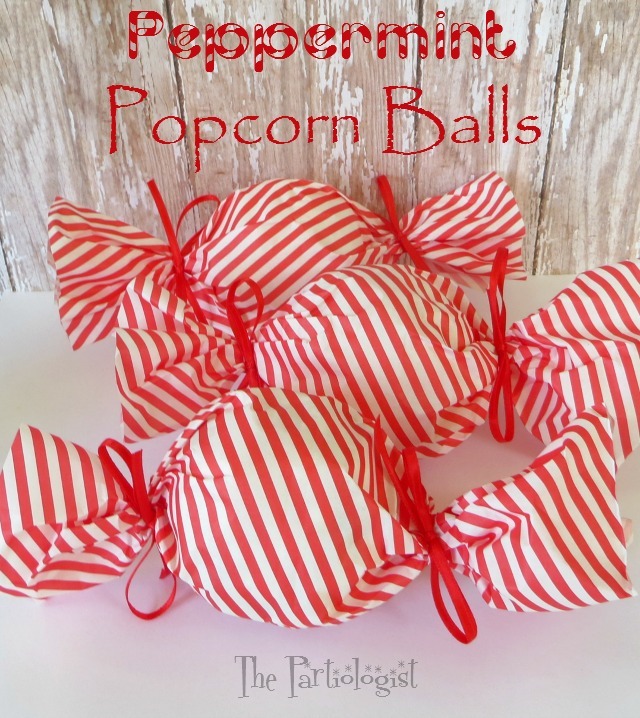 Oh, and did I mention I wrapped popcorn balls to look like peppermint candy? Yep, it looks like peppermint, only it tastes like a popcorn ball! That's because it IS a popcorn ball. And front and center were the cookies. My favorite cookies of all. 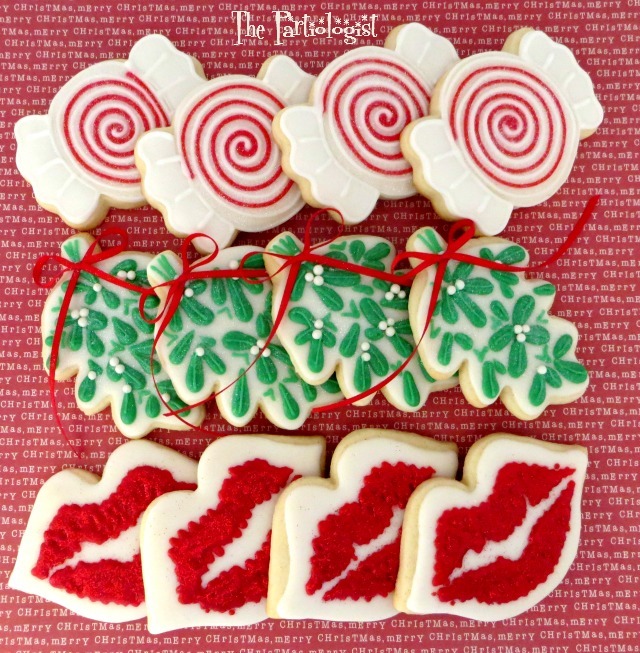 When I attended a Cookie Convention a couple of years ago, two uber talented cookie decorators, know as SugarBliss showcased their mistletoe and lip cookies and it was love at first bite. 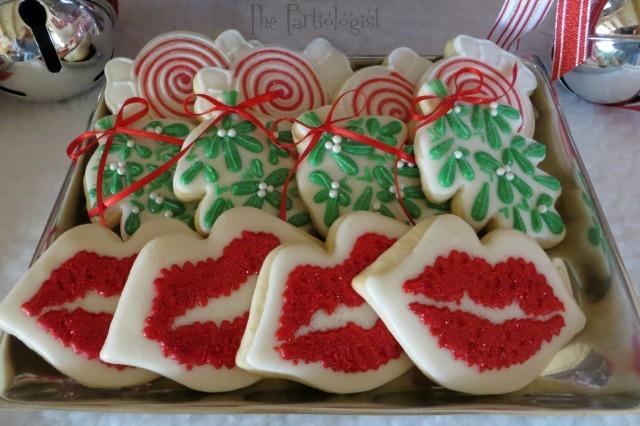 This year I decided to recreate the cookies and add the peppermint candy cookies so I could call them ~ "Peppermint Wishes and Mistletoe Kisses". Now, if you're not already entertained, I thought I would give a couple quick tutorials. To give the pretzels a caramel twist, I made homemade caramel, let it set. Cut into strips and wrap a strip around a pretzel rod. 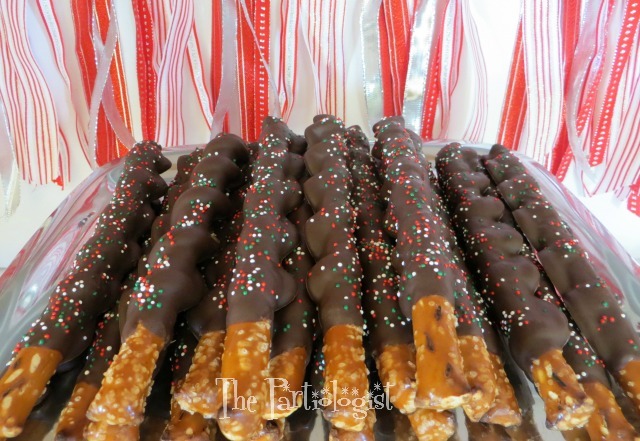 Dip the entire caramel wrapped pretzel into chocolate and sprinkle with SPRINKLES! Not knowing what peppermint inside popcorn would taste like, I decided to make regular popcorn balls and add mini M&M's. Form into balls and wrap each in saran wrap, then in striped parchment paper. 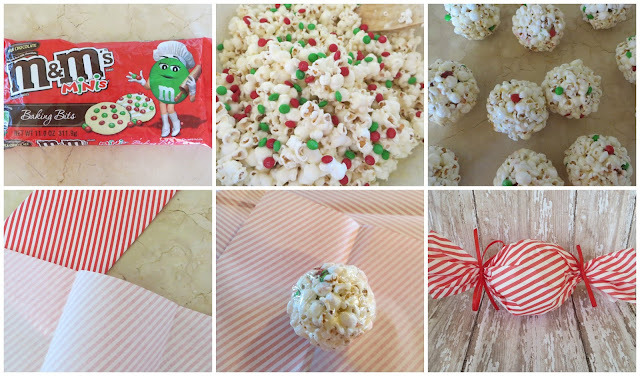 Tie the ends with ribbon and you've got yourself a peppermint popcorn ball. 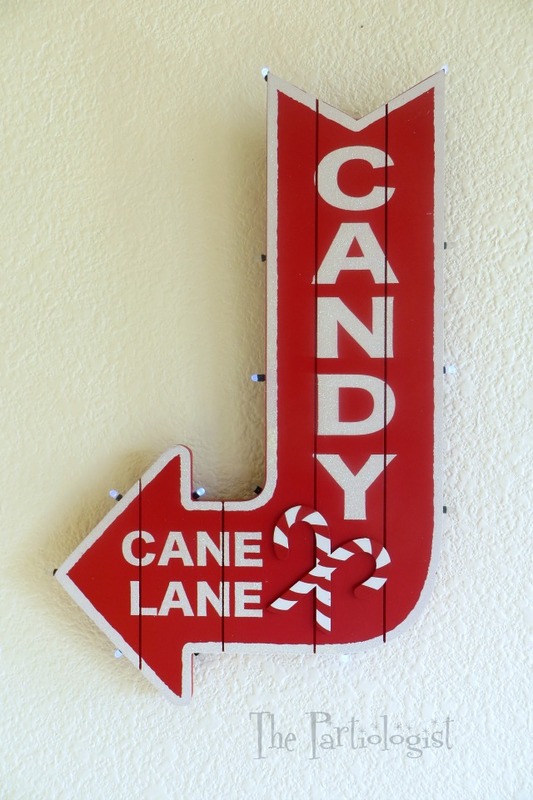 I added battery operated blinking lights to the back of the sign, which directed the guests to Candy Cane Lane! Christmas keeps me on my Mistletoes! Everything looks amazing. I love the twisted caramel pretzels and the cookies are spectacular as always. The castle is incredible. It turned out great. Every detail is perfectly executed. I'm sure your guests had a ball. I didn't know there was a palace! This looks like the best peppermint party ever. We need to make a peppermint party song just for you! It is perfect! 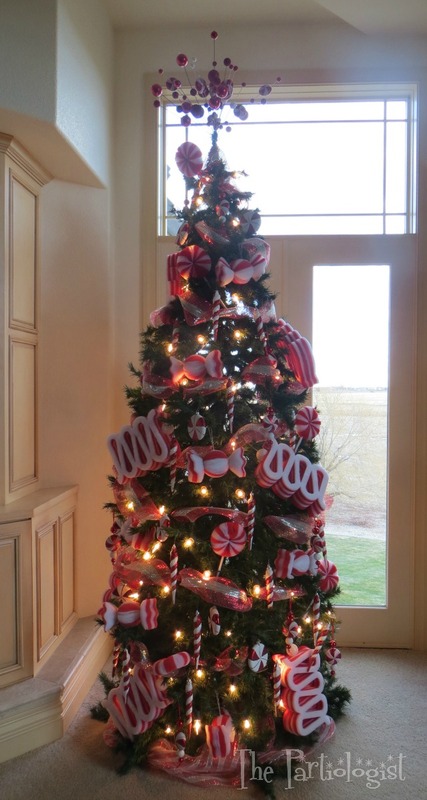 I love your peppermint tree and palace!! and your cookies look cute and delicious as usual. Thank you so much Libby for the sweet comment! LOVE, LOVE, LOVE reliving this!!! Thanks so much, the cookies were such fun! You are amazing! Your details are always so perfect! 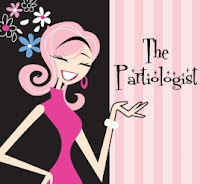 I really want to meet you and watch you put together a party!!!! Perfect every time! Loved everything...wish I were at the party...maybe you could host one for a few thousand people next year! Let me know IF you decide to do that!